SA's Got Talent is a South African reality competition television series produced by Rapid Blue and based on the British version of the show called Britain's Got Talent created by Simon Cowell, Ken Warwick and Cécile Frot-Coutaz which features amateur singers, dancers, magicians, comedians and other performers of all ages competing for a prize of R250,000 (this was increased to R500,000 for Season 6). SA's Got Talent, the homegrown equivalent of Simon Cowell's hit international reality talent search show which has produced unlikely stars such as Susan Boyle and Paul Potts, premiered in South Africa on 1 October, 2009. Initially hosted (for the first two seasons) by comedian Rob van Vuuren and radio DJ Anele Mdoda, the hosting duties were given to comedian Tats Nkonzo when the show moved to e.tv in 2012. After four seasons on the show, Tats made way for Tol A$$ Mo, from Season 7 in 2016. The presenters are typically joined by three judges who put the contestants through their paces: in the first two seasons they were radio and media personality Shado Twala, PR consultant and Idols judge Randall Abrahams and Strictly Come Dancing host and entertainer Ian von Memerty. Randall left the show for Season 3 and was replaced by musician, songwriter and actor Kabelo "Bouga Luv" Mabalane, best known as a star of the kwaito band TKZee. Von Memerty and Mabalane left after Season 4 and were replaced by DJ Fresh and Lalla Hirayama. Shado Twala remained as a judge for Season 5 and Tats Nkonzo returned as host. This combination was retained for Season 6, but for Season 7, Hirayama was replaced by Jamie Bartlett as the third judge. The key to this show is "any age, any act", which has proven to throw up numerous surprises in other international versions of the show,as well as this homegrown version. Thousands of hopefuls turn up to have their shot at fame in a variety of disciplines, from singing and dancing to ventriloquism and slam poetry. They then get the opportunity to face the three judges nationally, after which the finalists compete in a series of semi-finals and later the grand finale. Whether really, really good or really, really bad – these plucky hopefuls had the guts to audition. SA's Got Talent is executive produced by Kee-Leen Irvine for Rapid Blue. The Got Talent franchise is a British TV format conceived and owned by Simon Cowell's SYCO company. A pilot show was made in Britain, hosted by Paul O'Grady, but after O'Grady's acrimonious split with ITV the series was postponed, resulting in America's Got Talent becoming the first full series of the format. It has spawned spin-offs in 30 countries, in what is now referred to as the Got Talent format. Anele co-presents the weekday lunchtime show on 5FM between 12 noon and 3pm, with Grant Nash. The pair moved to the national youth station after shaking up the airwaves at 94.7 Highveld Stereo. Mdoda was a contestant on Strictly Come Dancing 5 (in 2008) and freely admits to being “not your average female jock”. Rob is well known for his comedy shows as well as performances in films such as Crazy Monkey: Straight Outta Benoni and Footskating 101, but first caught the public's imagination as part of the wacky comedy duo Corné and Twakkie on SABC2's The Most Amazing Show. He was also a contestant on Strictly Come Dancing 5, winning the season with his partner Mary Martin. Tats got his big break when he made the Top 8 of the SABC1 reality competition So You Think You're Funny!, in 2008. Once the show ended he was asked to tour with the Top 3 from the season. He was also a Top 24 finalist in the third season of M-Net's Idols, in 2005, and is known for his musical segments on the fourth season of the eNews Channel's satirical news show Late Nite News with Loyiso Gola, in 2012. Comedian and television personality known for his appearances on numerous television series, including Mo Love on Vuzu, in which he stars with his wife Mome Nale. In 2013 Mo joined Masechaba Lekalake and Refilwe Modiselle as a co-host of the eKasi+ and e.tv talk show Eksê: Let's Talk with Masechaba Lekalake. Randall has a lengthy pedigree in the entertainment business. He is best known for judging five seasons of M-Net's Idols, but also boasts a CV that includes being station manager at Good Hope FM, helping establish Yfm, and steering 5FM, METRO FM and GHFM into a new era as general manager of commercial radio at the SABC. Ian has presented the SABC2 reality competition Strictly Come Dancing since 2006 and is well known for his hit two-piano theatre show A Handful of Keys, which celebrates its 1,000th performance in August, having played to over 300,000 people. Shado became a household name as a presenter on radio stations such as Radio Bop, METRO FM, 702, P4 and Cape Talk, and recently returned to the airwaves on Heart 104.9FM. In recent years she has diversified into the media and public relations sphere, working for the Western Cape government, and currently manages her own entertainment business. Kwaito musician, actor and presenter Kabelo "Bouga Luv" Mabalane replaced Randall Abrahams as a judge on the third season of the show on e.tv. He has opened shows for musicians such as Jay-Z, 50 Cent, Ja Rule and Rihanna and is co-owner of Faith Records, an independent music company. DJ Fresh (real name Thato Sikwane) is a Botswana-born South African disc jockey and mix master who became known first for his breakfast slot on radio station YFM (which he hosted for eight years) and later as the host of the Drive Time (16h00 - 19h00) on 5FM. Lalla Hirayama is a Japanese-born South African dancer, actress, model, television presenter and voice artist best known for hosting the Vuzu shows Masters of Rhythm and V-Entertainment. Actor best known for his roles as the shady Mike O'Reilly in the SABC3 soapie Isidingo; and as David Genaro in the e.tv soapie Rhythm City. 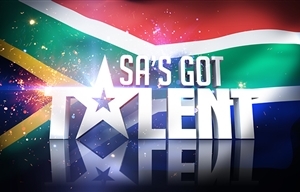 SA's Got Talent premiered on SABC2 on Thursday 1 October 2009, at 19h30. After two seasons and a two-year hiatus the show moved to e.tv. Returning reality shows include Ultimate Braai Master on e.tv, The Voice SA on M-Net and Say Yes to the Dress on TLC. Three years later and DJ Arch Jnr's "Got Talent" act remains the same, except now you can hardly see it! Hawaii Five-0 8 surfs onto City, MMA comes to eReality with Fight Xchange 2 and SA's Got Talent 7 airs on eExtra.